The exhibition is a collaboration between the ceramic collection at Aberystwyth and Philip Eglin, one of the major ceramicists in the UK. Over the course of the project Eglin visited the collection and made drawings and photographs of key pieces. Eglin has always been a borrower responding to things he loves in the world around him. Great paintings, old pots, children’s drawings or plastic bottles – all become sources of inspiration and flash points to set the artist’s eye on a new trajectory. He enjoys working with museum collections and, in Aberystwyth, he quickly identified the collection of nineteenth century slipware, much of it from Buckley in North Wales, as a potential for a new body of work. 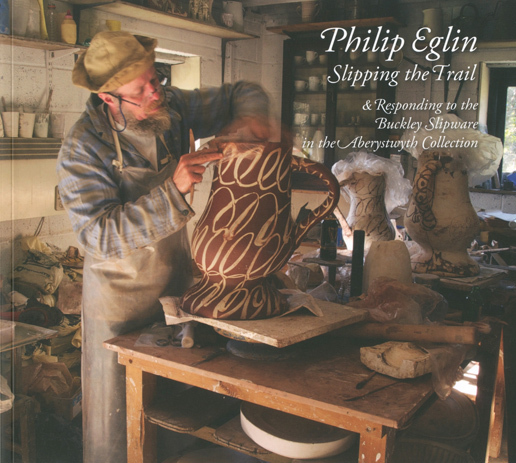 It is especially appropriate for the exhibition that the photographer, Oliver Eglin, Philip’s son, agreed to produce the beautiful photographs for the catalogue and of his father in the studio.